…is the latest blockbuster exhibition at the Royal Academy from 11 February to 17 April 2017. I went along to the preview on Friday. Like the enormous Bolshevik, left, this is a big exhibition with twelve large rooms encompassing painting, sculpture, ceramics and textiles and film and photography. 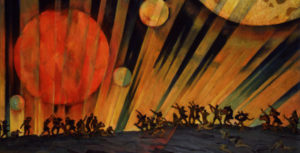 One hundred years after the Russian Revolution, its inspiration is the exhibition Fifteen Years of Artists of the Russian Soviet Republic, curated by Nikolai Punin, which was the first retrospective of the art of the revolution and took place in Leningrad in 1932 . The art within it covers the period from the Bolshevik overthrow of the Socialists in October 1917 through the ensuing civil war, the formation of the Communist Party and the USSR, Lenin’s death, Trotsky’s expulsion and Stalin’s rise to ultimate power. Momentous times. Like most folk I was aware of Socialist Realism, paintings of honed and heroic workers in blocks of colour and I know of and like the painting of specific Russians, like Marc Chagall, Vasily Kandinsky and Kazimir Malevich. 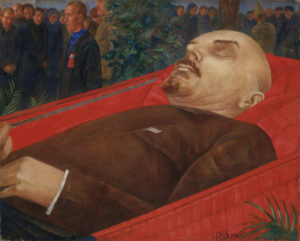 I appreciate that art has often served as propaganda, though I hadn’t realised that Lenin had a very specific use for art in his Plan for Monumental Propaganda. Indeed the exhibition is strong on the relationship between the various leaders and art. So we have Lenin’s ‘snip, snip’ remark about how, once art has served its purpose in spreading Bolshevik ideology, it would be cut out of his country’s life completely. Whereas Stalin was, despite his signing all those death warrants, comparatively well read and refined, understanding that art couldn’t be abolished, but had to be subverted and controlled. 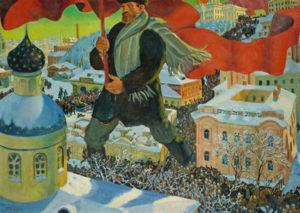 It’s captures the shift from early optimism, when artists embraced the revolution, to disenchantment and eventual conformance or death and Stalin’s decree that, from 1932 onwards, Socialist Realism was the only approved style of art in the USSR. The dichotomy between city and country, between the old and the replacement religions is here, as is the death toll, from starvation and the purges. Communism failed and had great cost in terms of death and slaughter. I found myself thinking of Animal Farm on more than one occasion. But at times I thought that the commentary for this exhibition was unsubtle and unbalanced, the Bolsheviks are definitely the villains here. It would have been good to have a counter perspective of the ‘great experiment’. Collective ownership for the good of all, or some element of it, might even today be better than private ownership of everything to benefit the few and to the detriment of many. There are no nuances in the exhibition’s commentary. But what of the art? 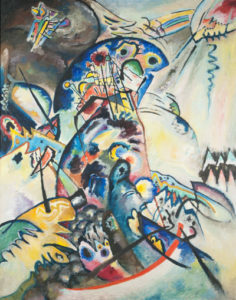 The energy and pluralism of styles and developments is evident, with examples of ‘classic’ figurative portrait painting (of Lenin for example ), abstract art, the avant-garde and Malevich’s Suprematism. I particularly liked the ceramics, though I wondered who would be buying the delicate, beautiful and, presumably, expensive porcelain tea sets decorated with figures of workers looking not unlike the red-on-black work of ancient Greek pottery. The film is good too, Eisenstein as well as comedy. I’m grateful that the exhibition brought Kuzma Petrov-Vodkin to my attention for the first time. A realist painter of sophistication and great skill he painted landscapes and interiors but most of all wonderful still life paintings (take a look at the reflections in the silver samovar). 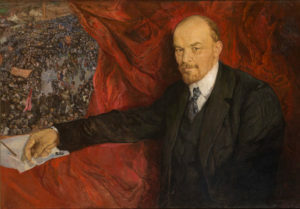 His self-portrait is very fine and he is one of only a few artists who were permitted to see and draw Lenin’s corpse (his painting captures the waxwork-like pallor of its subject). I could mention much more. Like the constructed ‘approved’ apartment, without a kitchen because the comrades all ate together in the canteen, which resembles a rather sparse photo from an Ikea catalogue (good design but what an irony). Or the delicate flying machine. But I suggest that you go and see it for yourself, it is well worth a visit. Entry is £16 (£18 with Gift Aid ) or £15 concessions and the nearest underground station is Green Park ( Victoria and Bakerloo lines ).